It’s no secret that Southerners like their sweet tea, but we also enjoy our wine, too. North Carolina was actually the first place in the nation that cultivated the grape vine and it’s the only place in the world where every type of grape is grown. That’s right. Every type of grape! Because the Scuppernong grape is our official state fruit and we like sweet tea, many people, even a few of our in state residents, think all of our wines are of the sweeter variety, but that is totally false. North Carolina also produces the European-style vinifera grapes. These types of grapes are the same grapes that are grown in California, Oregon, Washington, and France. These vinifera grape varieties include Cabernet Sauvignon, Cabernet Franc, Merlot, Syrah, Chardonnay and Viognier. The majority of these grapes are grown in one particular cluster in North Carolina called the Yadkin Valley Wine Region. This region is a federally recognized American Viticultural Area (AVA) and is located in northwestern North Carolina. 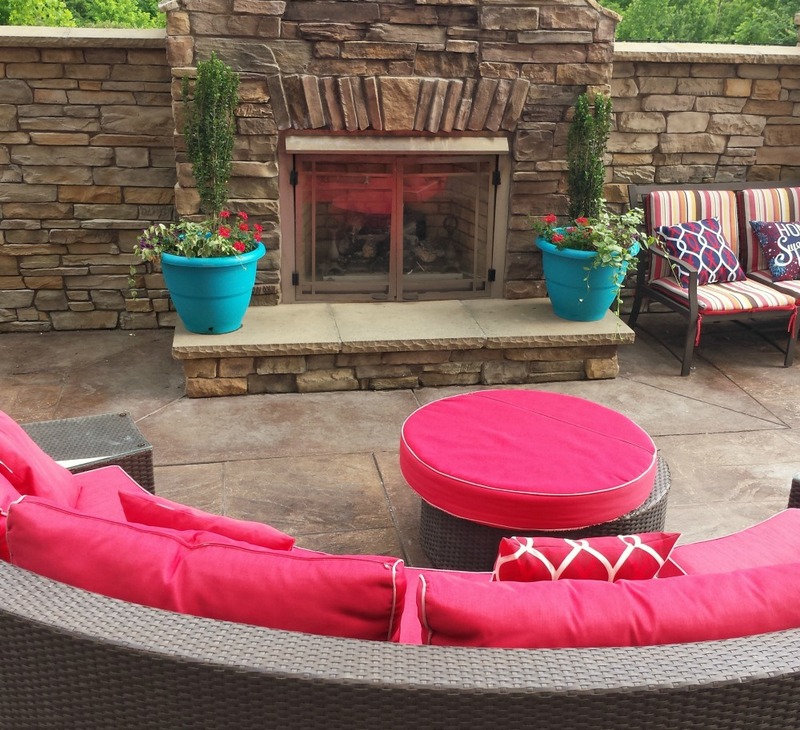 In this particular area of the state which is very near the city of Winston-Salem, there are nearly 40 wineries and about 400 acres devoted to vineyards. One of my favorite shots I took of Elkin that I posted on Instagram. For my visit, I chose Elkin, North Carolina to be our base in Surry County. 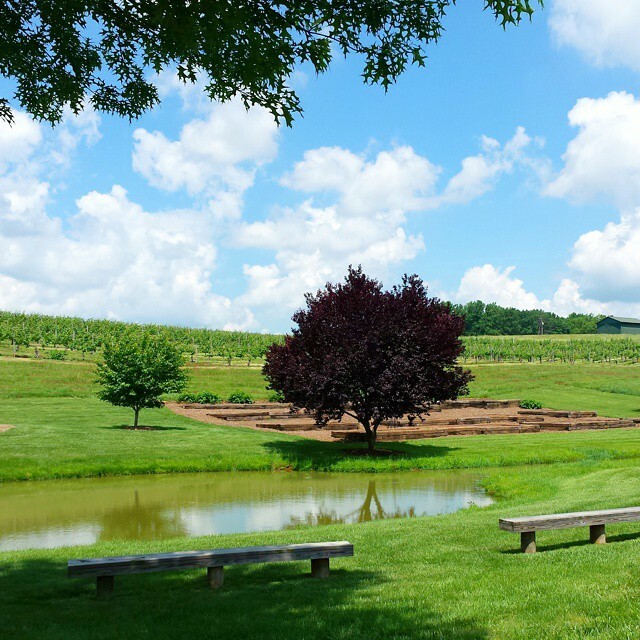 Surry County is home to 17 vineyards, and it would be impossible to visit them all in one weekend. For this girlfriend’s getaway,we mainly concentrated on visiting wineries of the Upper Yadkin Wine Trail as well as Shelton Vineyards in Dobson, N.C, which is state’s largest family-owned winery. 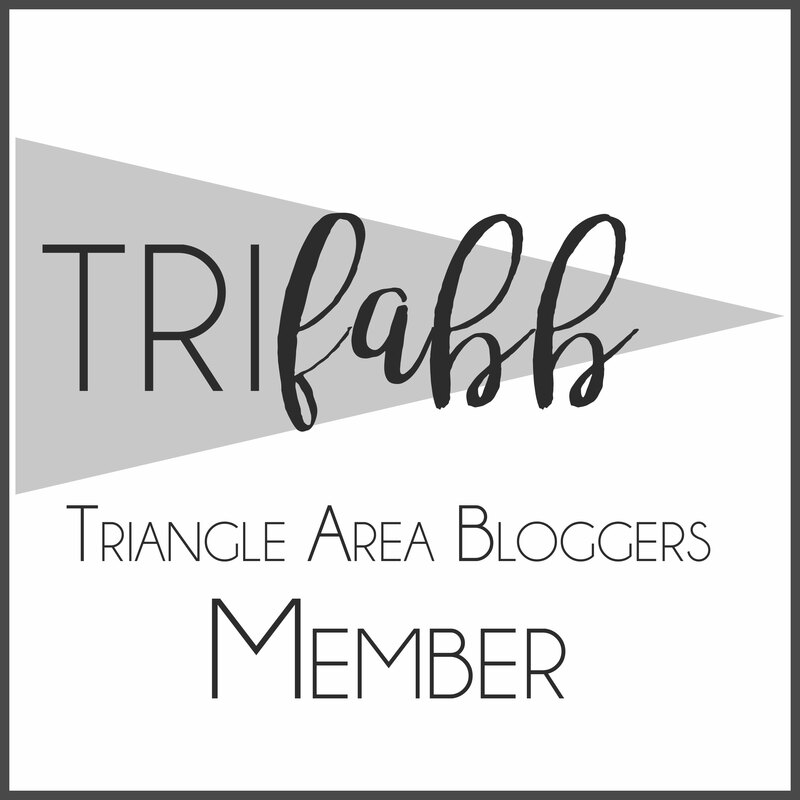 We visited six wineries (Brushy Mountain, Shelton Vineyards, Grassy Creek Vineyard and Winery, McRitchie Winery and Ciderworks, Jones vonDrehle, and Elkin Creek Vineyard) in about 48 hours. Yes, we were busy. Elkin is about a three-hour drive from Raleigh,and about half an hour from Winston-Salem, N.C. We started our trip at 1:00 p.m. and checked in to our hotel by 4:00 p.m. 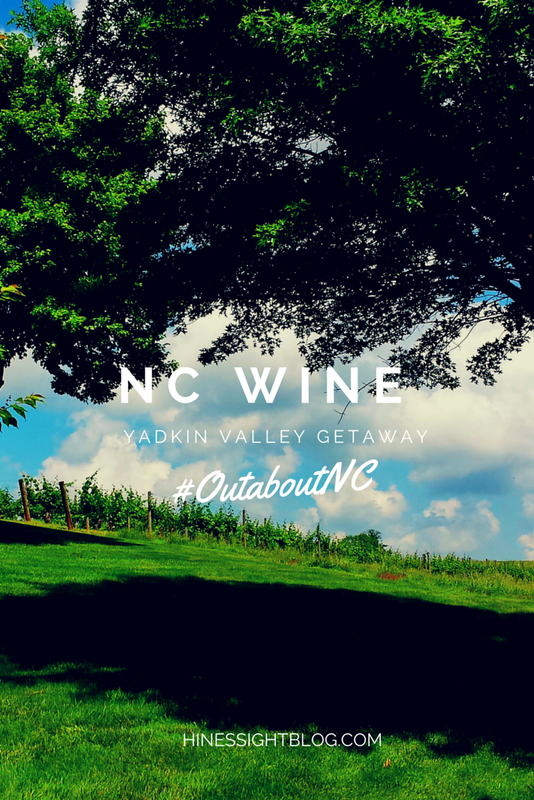 The Yadkin Valley Wine Region has a lot of accommodations for all budgets, and many of those are adorable cabins and Bed and Breakfast Inns that would be perfect for couples. 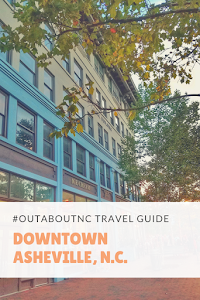 For this particular trip, since I was traveling with my friend from Wilmington, and we wanted to be close to downtown Elkin, we chose a national hotel chain that was far from cookie-cutter and bland. I selected The Fairfield Inn and Suites in Elkin, which is a great location, close to the wineries we visited and an easy five minutes drive to downtown Elkin. 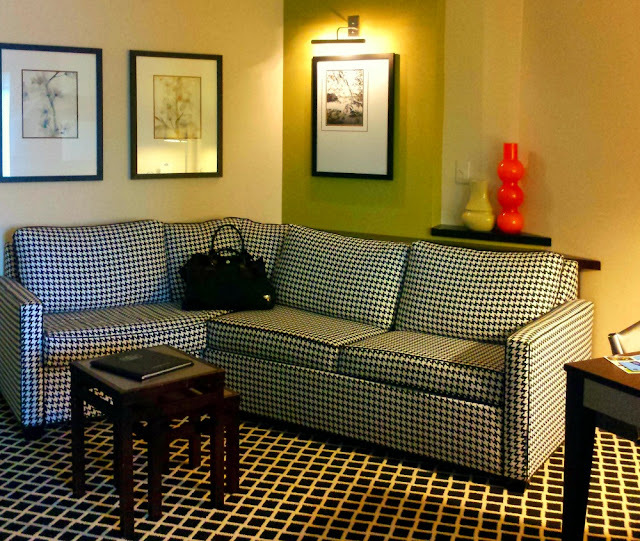 This Elkin hotel has been a top-rated Marriott in the U.S. for several years in a row and is the perfect hotel for family and girlfriend getaways. 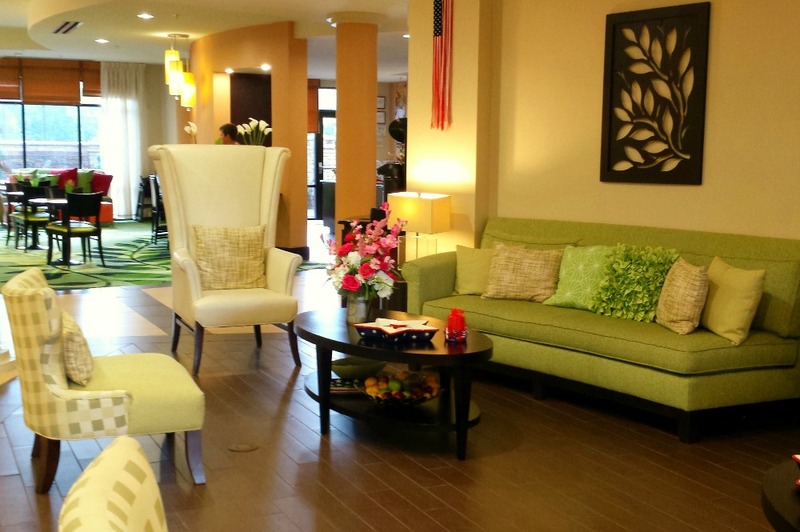 It was the perfect base for us with attractive common areas. Rooms were spacious, comfortable, and a good price. Rates are under $150 per night and include breakfast, free Wi-Fi, and wine tastings. I also loved that the hotel had coffee, food, and drinks with easy access all-day; not just for breakfast. 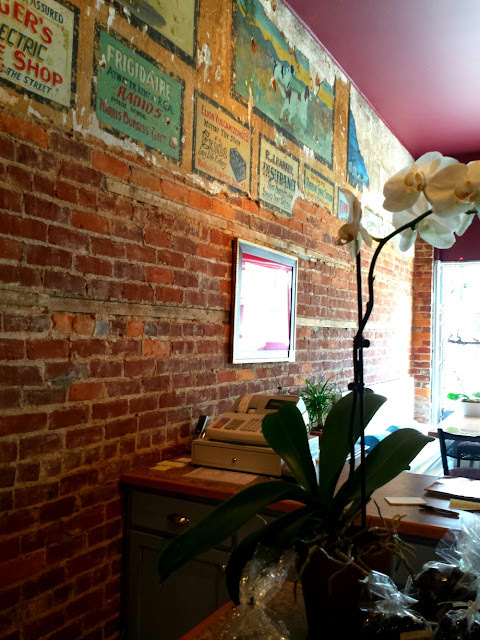 This urban winery in downtown Elkin offers modern day sophistication in the old Elkin Canning Company that operated from 1898 to 1922. With live music in a casual atmosphere, this is the place where you want to buy a glass of wine or two and spend hours. Winemaker Jason Wiseman makes the wine downstairs in a cellar-like atmosphere, and most of the wines are named after historic places in the area. He has produced a fabulous Chardonnay called the “Yadkin Valley” which he has fermented in both stainless steel and aged sur-lie French oak barrels. It was a great combination and one of my favorites. Another favorite of mine was the “Red Bud Ridge Red” from the fantastic 2007 harvest, which had a lot of dry days and cool nights, according to Wiseman. It is a blend of Cabernet Sauvignon, Cabernet Franc, Merlot, and Chambourcin. 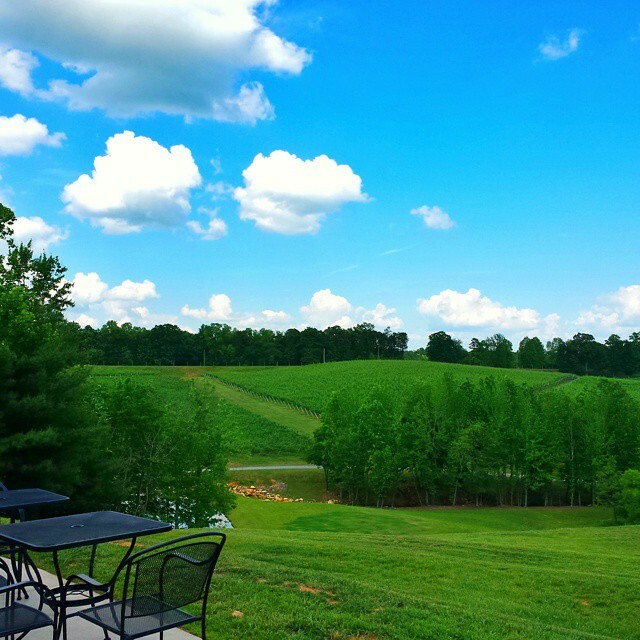 This winery’s tasting room is a must-visit when in Elkin. 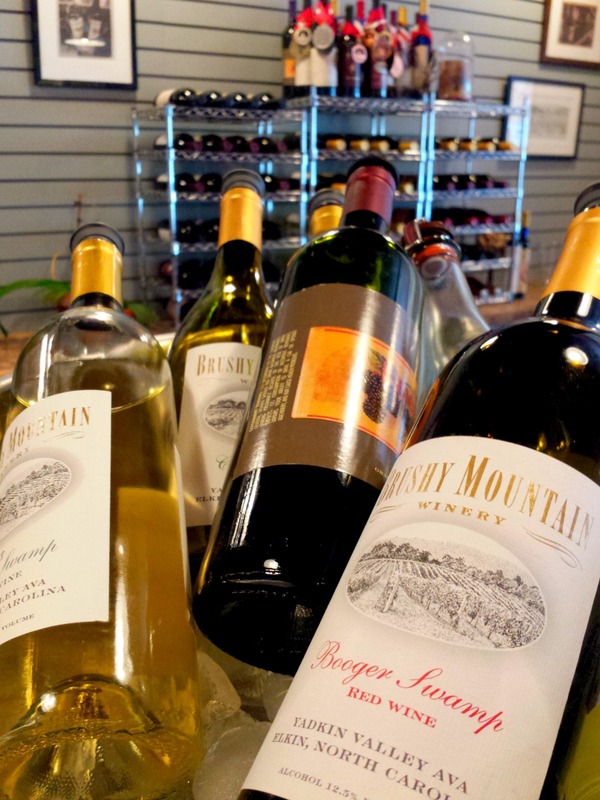 Brushy Mountain Winery is open Thursday through Sunday afternoons, closing at 5 p.m except on Friday and Saturday evenings. 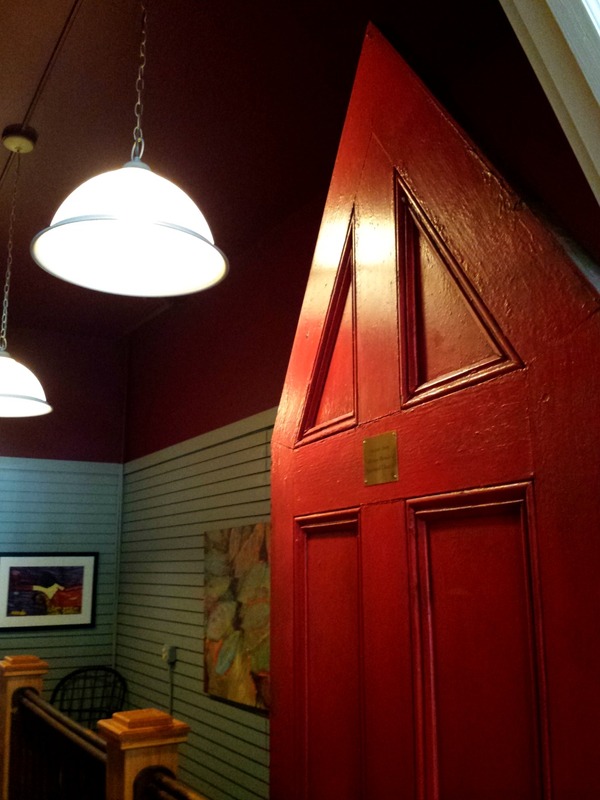 On these nights, it stays open until 8 p.m. Brushy Mountain Vineyard is located at 125 West Main Street in Elkin. 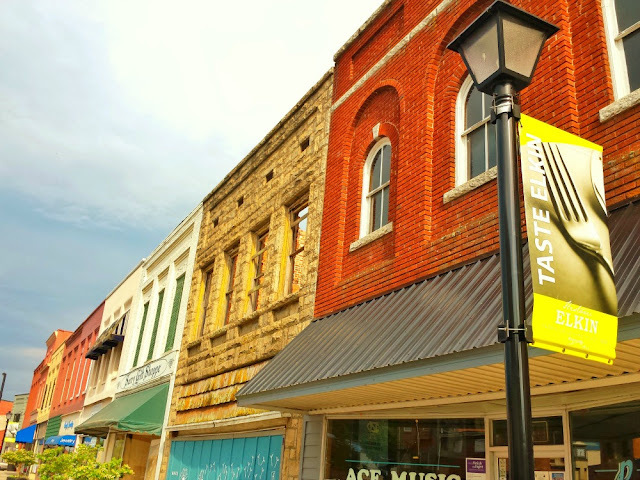 Downtown Elkin may be a small town, but it impresses with its restaurant selection. 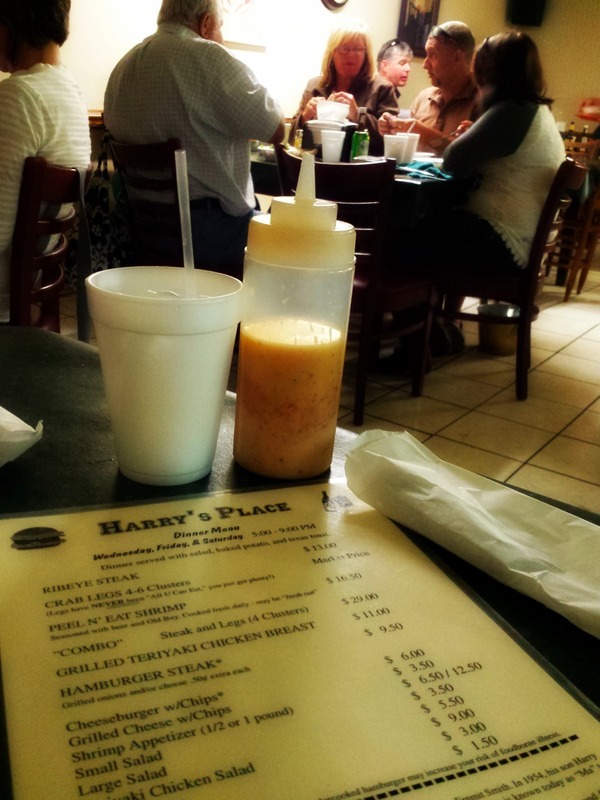 Popular restaurants are Heaven’s Scent Restaurant, Fiddle’s Pub, 222 Public House at the Liberty, and Harry’s Place Restaurant and Bar, a local favorite that has been serving residents since 1954, serving seafood and steaks. We chose Harry’s Place. It serves dinner on Wednesday, Friday and Saturday evenings only. I decided to take some photos of Elkin and told my friend to put our name on the list. There was a wait. She placed our name on a clipboard on the wall, and we waited for our table outside for about 30 minutes. There is nothing attractive about this restaurant at all. But, with the waiting crowd, we knew it must be good. The open, short-order grill is inside the dining room. The restaurant doesn’t appear to have changed since 1954. And honestly, I don’t think the prices have changed too much either. I ate for less than $14 with a tip. 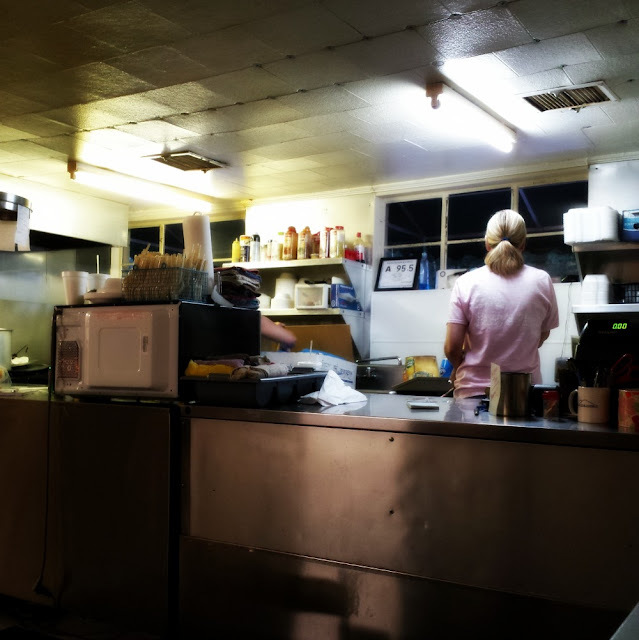 Once our food arrived, we quickly realized why this has been an Elkin dining staple since 1954. My own Dad used to have a restaurant that rivaled this one with simple cuisine, and for the first time in 15 years, I tasted a country style steak with peppers and onions and Texas toast that was as good as what he served. If you’re a big city, Whole Foods type shopper, who can’t eat anything, but organic then you may want to skip it, but I’ve been told it has some of the best crab legs for $20 that you can eat. 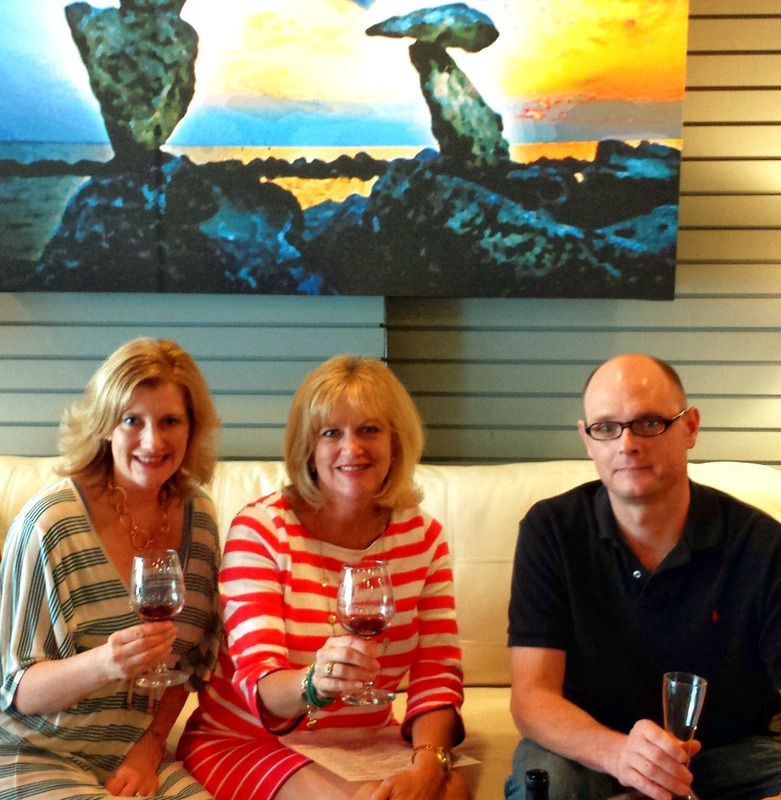 The Fairfield Inn has a great wine shop, and the most perfect spot to relax and catch up with a friend. On our next post, get ready to explore the other wineries during the weekend. Parkway Wine Tours met us at the hotel at 10 a.m. and our driver, Billy, treated us like queens. Stay tuned. Be sure to not to miss a post and subscribe by email on the top right sidebar corner. Join us every Thursday on the first of the month for Instagram Travel Thursday, founded by Skimbaco Lifestyle. I have a secret. When I don't want to do my work I escape by looking at real estate and hotels. It's kind of dangerous because it keeps me from doing my work, which is why I have to totally disconnect the internet when I'm writing a lot. Because I've been on vacation and am still working on my N.C. wine travel guide for #OutaboutNC, I have a guest post by Jennifer Riner of Zillow. 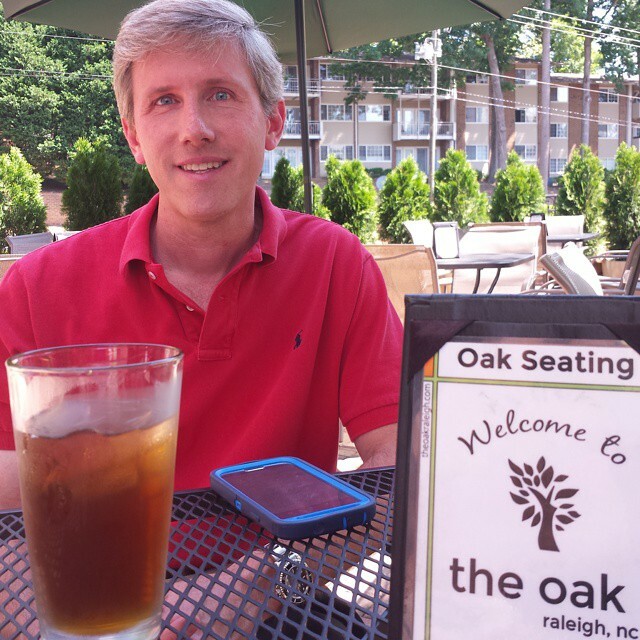 Soon, Zillow will be interviewing me about my favorite things in Raleigh, N.C.and I'll be on its blog. In the meantime, they are the experts on decor. I love Jennifer's ideas for travel-inspired decor. Wanderlust is the strong inclination to travel the world. The word originated in Germany in the early 20th century and has made its way to adventure seekers across the globe. You may have a strong case of wanderlust, especially during the summer season, but your budget or career limits how often you can explore new cities. 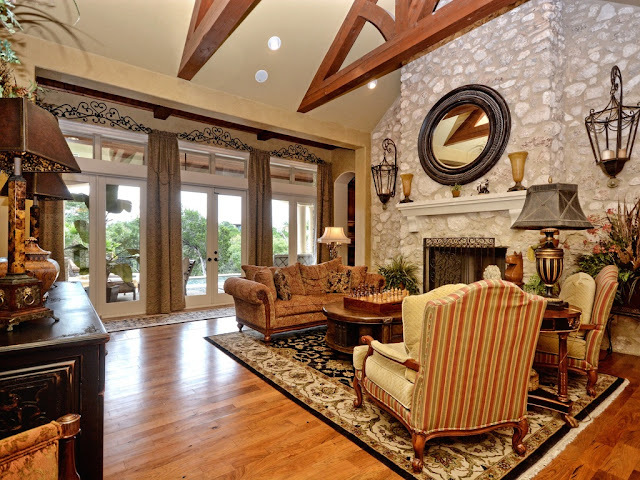 Even if you can’t physically visit new territory, you can incorporate cultural flair into your interior design. Check out these six options for travel-inspired home accessories. 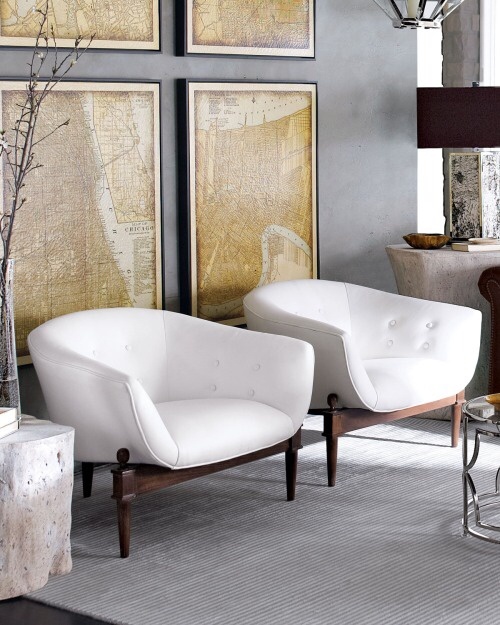 Create some global flair in your home with large, framed maps. You can opt for color, sepia or black and white maps, depending on your current color scheme. If you have a strong color like yellow painted on the walls, go with black and white. A colorful map might make your already bright space look like a classroom. 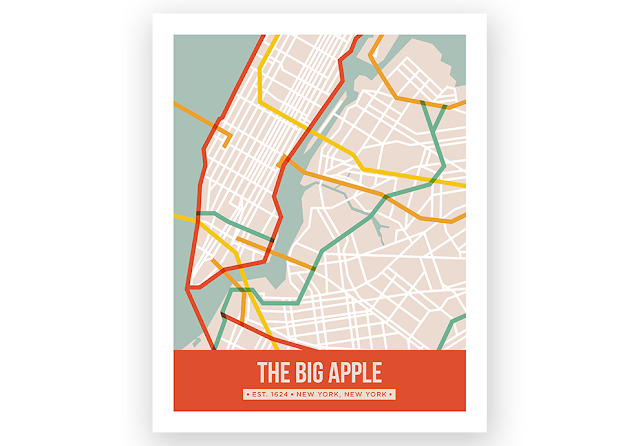 Skimbaco Lifestyle curates this Big Apple print in its store. Printed maps like this make great travel-themed art. Even in today’s world of tech-based documents and electronic filing, traveling still comes with back-up hard copies of boarding passes, passports, identification papers, frequent flyer cards and baggage claim tickets. Rather than discard old or invalid papers, consider using them as design elements. Purchase a large corkboard and pin various documents in a slightly overlapping pattern. Then, hang behind a sofa or bed as a frequent reminder of your past trips. Old, broken suitcases can be reused as storage pieces or décor statements at home. You can even use old suitcases outdoors as fun, garden-friendly planters. If you’re limited by space in an apartment, you might consider container gardening on the balcony as a way to exercise your green thumb without a yard. Suitcases are the perfect mediums for flowerbeds. Inside the home, you can use the fronts of suitcases as wall shelving. You’ll need a table saw – which requires caution and some expertise – and some sturdy, square suitcases. 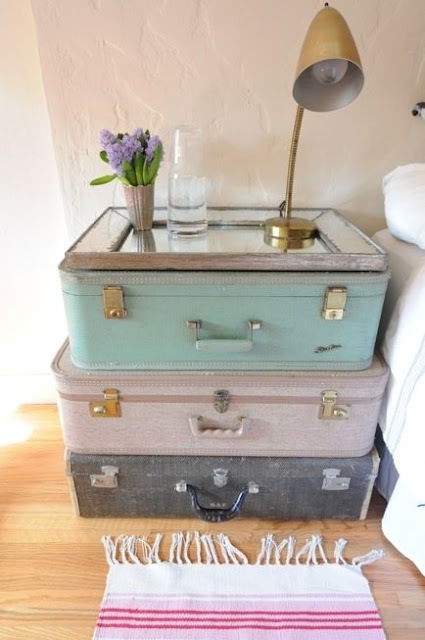 Vintage travel trunks are filled with character and by simply adding legs you create an eclectic style coffee or end table. If you don’t have old, hard cases, try the nearest thrift store. No matter the project, don’t worry about luggage being in pristine condition. The more dings and scratches, the more memories each suitcase holds. Plenty of design-savvy homeowners incorporate artwork featuring landmarks like the Eiffel Tower, Big Ben, the Great Pyramid of Giza and the Taj Mahal, depending on their favorite destination abroad. 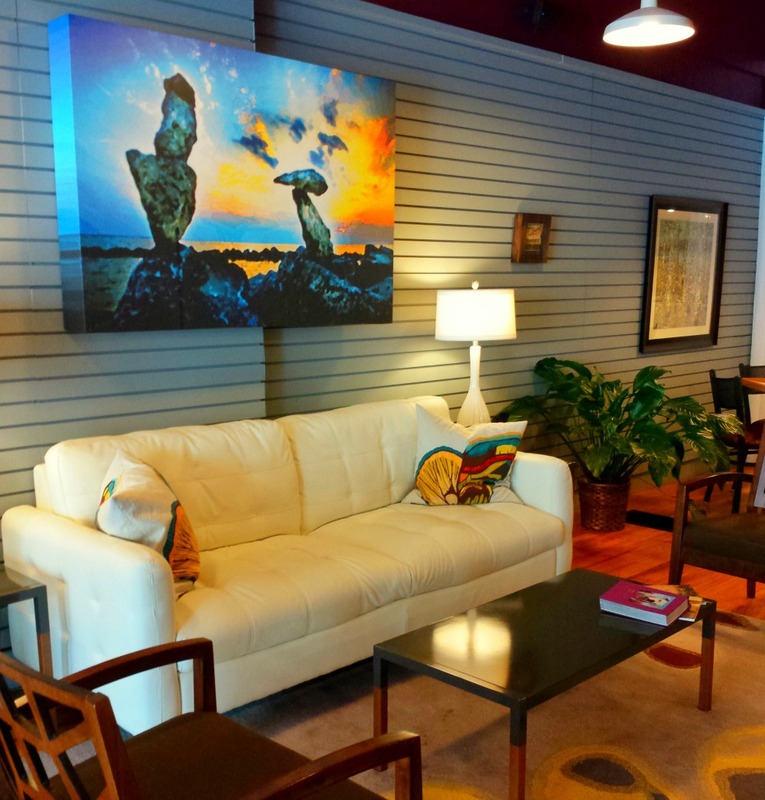 Why not incorporate more than one cultural landmark for an eclectic vibe? Just make sure that all photographs and prints have the same or complementary colors with similar framing. Otherwise, your artwork appears chaotic instead of worldly. 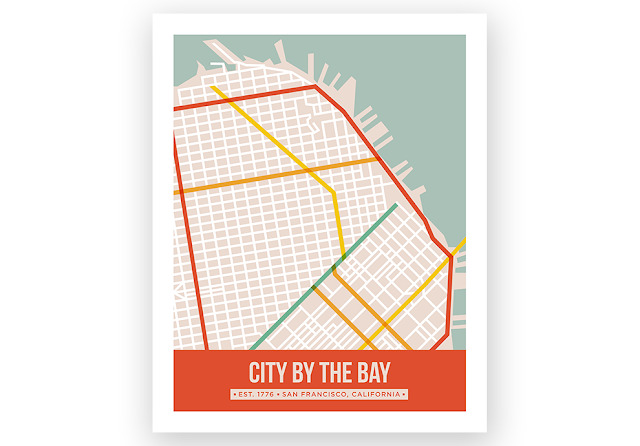 Add these city landmark prints to your own to inspire travel. 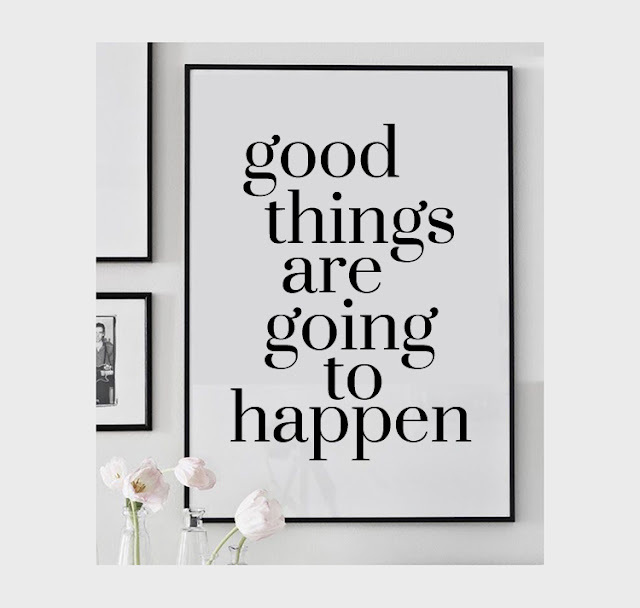 These fashionable prints will have have your apartment chic in no time. Novels and hardcovers are classic representations of various lands and languages. Instead of overfilling your bookshelves or adding clutter to your coffee table, stack books and use them as end tables on the sides of sofas or beds. Coffee table books aren’t inexpensive, so using your previously acquired literature is recommended. If you desire the stacked look but lack the inventory, make this a long-term project so you know what to seek out as souvenirs on your next trip. Persian, Moroccan and Oriental patterns are some of the most traditional ways of adding sophisticated character at home. When purchased in the U.S., authentic Middle Eastern and Asian carpets are considered rare and therefore come with higher price tags. The next time you are visiting a country specializing in handmade rugs, shop around the small boutiques and street vendors who likely sell them for far less than U.S. prices. Just because you can’t travel doesn’t mean you can’t be inspired by various cultures around the world. 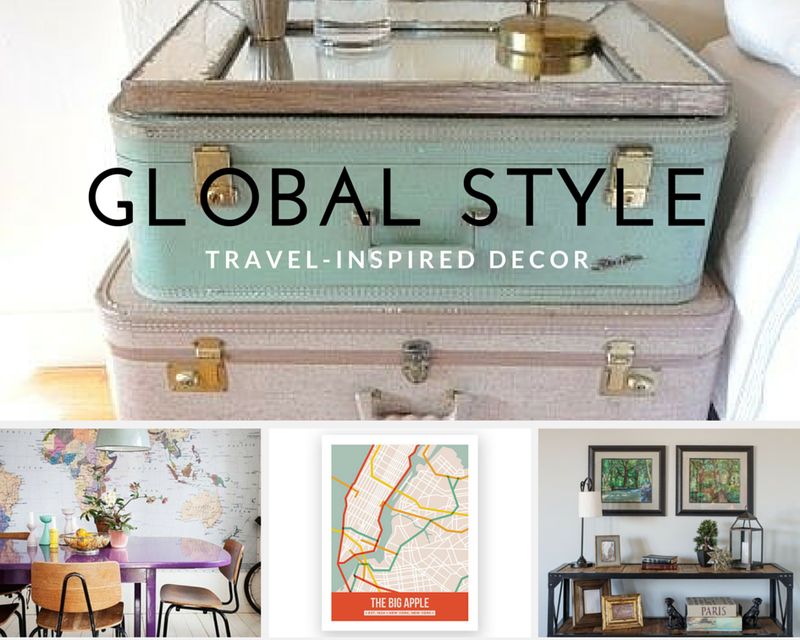 Spice up your interior style with travel-inspired décor whether you’re cramped into a small Raleigh apartment, visualizing your lifestyle while shopping for a home or settling back into your house after a month abroad. You’ll feel most at home when your interior design truly reflects your style. 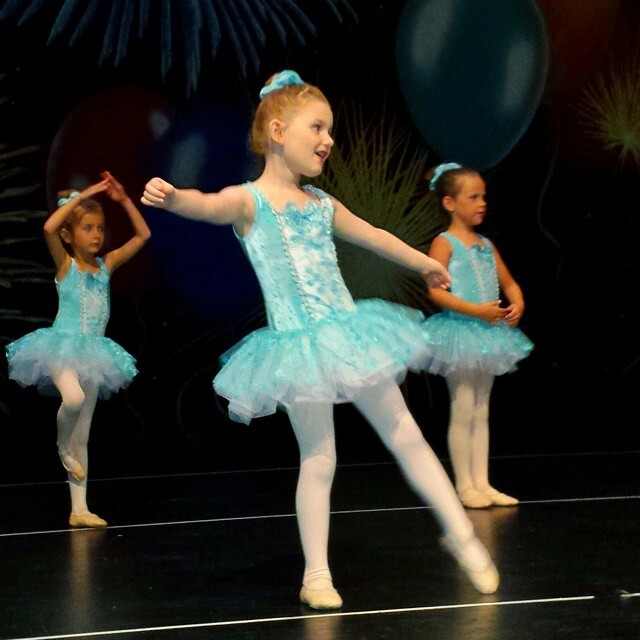 Photos by Zillow.com, Great.ly.com and Amazon.com. Disclosure: This post does contain affiliate links where I receive compensation for purchases. It's been awhile since I posted a recipe. Earlier this year, I dropped about six pounds by incorporating a breakfast smoothie in my morning routine. Unfortunately, I still struggle with battling pounds at this hormonal crossroads in my life. I'm not alone. 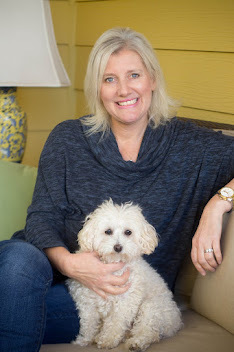 Perimenopause has wrecked havoc on my waistline, and it's not easy for me because I do have hypothyroidism. As a travel writer, I also taste a lot of food and beverages. I find that when I dine out often or drink alcoholic beverages, the harder it is to keep my weight in check. This book by Denise Austin was a great resource for me as well as some advice from Dr. Oz on weight loss. 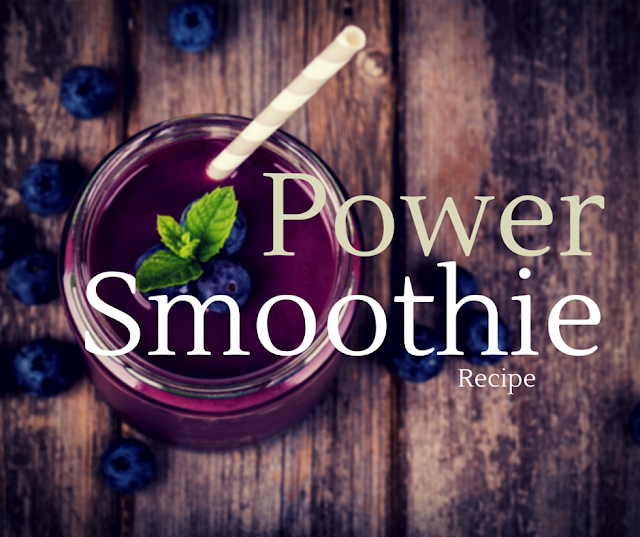 I've taken a little bit of information from here and there, and made my power smoothie as part of my routine to help maintain my weight. In order for me to lose weight, I have to dine out less, drink very little alcohol, cut calories with a regimented eating plan, drink more water than what is in a river, and exercise more often. It's not really an easy task. I am no where near the same weight I was when I finished a detox routine on this blog three years ago. I sometimes wonder if I will ever see that same weight again, and right now, my goal is to keep weight off and not worry about where I was 3 years ago. I've got several trips planned this summer and I'm not dieting, but in between, I will come home and get right back to starting my mornings with my power smoothie. I have used many different protein mixes since January, and now I've found a favorite protein powder that I'm sticking with for many reasons. 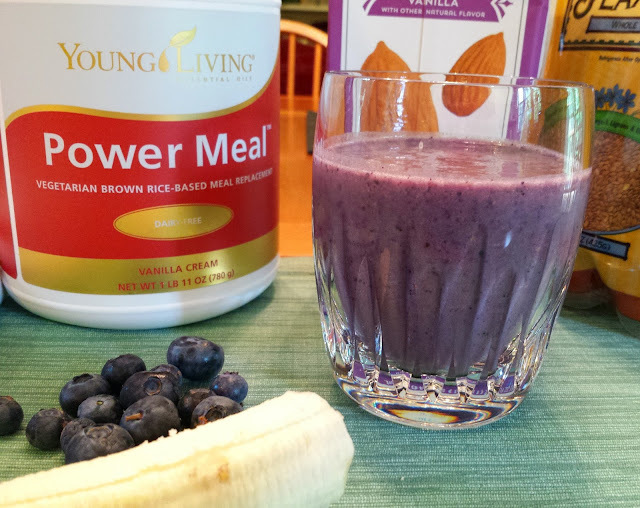 Power Meal by Young Living packs in 20 grams of protein in a rice-based meal form which was hard for me to find in retail stores when I looked locally. Power Meal is rich in taste, calcium, antioxidants and amino acids. I do not pay retail prices for this and I get a member price which is 24% off of retail prices. So far, it's been a month since my first shipment, and the container is not even half-empty. I think at one smoothie a day, it's going to last a long time which also helps justify the cost. There is also a new protein powder that is whey protein that is new on the market. I've just bought that one as well and am really pleased. Blend. If you like it more frozen, add a few ice cubes. Enjoy. It's that easy. The Young Living Power Meal has 187 calories per two scoops. It is also rich in potassium at 149 mg per serving which is still just a small part of the 4700mg we need daily. Dr. Oz has a good list of foods that will give us more potassium in our diet. I still belong to Papa Spud's locally, and I'm cooking farm-fresh vegetables almost nightly, too to help get the vitamins I need in my diet. I hope you enjoy my new breakfast routine as much as I do. It's even better now that I've found my Power Meal. Email me at hinessightblog@gmail.com to learn more about Young Living products. Use the subject line: Young Living. To order retail, complete this form, but I highly recommend that you join as a member, and save on the products. You can join for less than a price of a BJS Membership. Sign up for my mailing list for Young Living Information.